It probably goes without saying that Speed Brawl is a gorgeous game; it features charming Victorian-era characters and environments, along with sleek animations and an eye-popping colour palette. It’s almost like watching a cartoon from the nineties. Even the menus look stylish, but there is a lot more to the game than just appealing visuals. Speed Brawl is a fast-paced action beat ‘em up with a heavy emphasis on, well… speed. Following a brief introductory level, the plot brings its focus on two heroines, Ebba and Bia, who want to make it big within the brawling scene and earn their place under the spotlight. However, as is the case with all aspirations in life, the beginnings are humble and they must start their journey from the lowliest league of them all – Threepenny – run by the petty schmuck, Willy Adams. To reach the more prestigious leagues, the two girls must fight their way through a series of increasingly difficult championships and prove their worth to other owners. The plot is simple and straightforward, but it gives context to subsequently unfolding events and an ample amount of the world’s backstory is told through loading screens. Most championships consist of multiple stages and require you to clear them within a set time in order to progress. Each level takes place in variously themed environments with beautifully detailed backgrounds, and gameplay is reminiscent of oh-so-many 2D action-platformers. 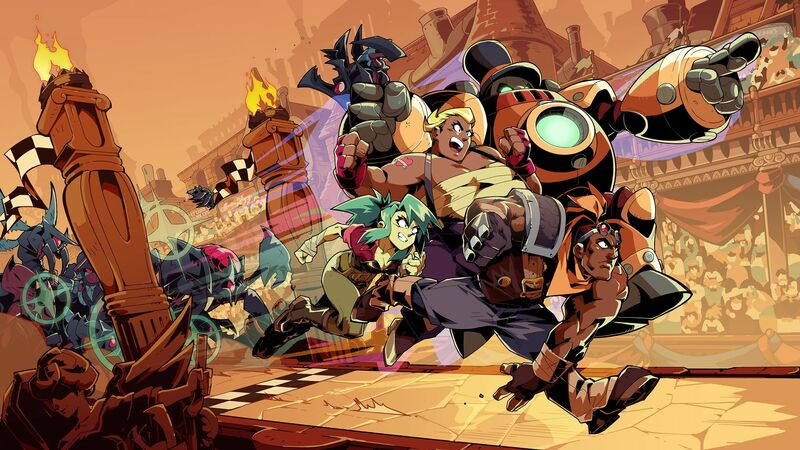 At the start of each championship, the player may select a duo from the available brawlers; initially, it’s just Ebba and Bia, but new brawlers gradually join the roster, including Cassie, a witty French mademoiselle who looks like she stepped straight out of the Flintstones universe. Once characters enter the stage, they must reach the finish line as quickly as possible, while also defeating every enemy along the way. In addition to unique special and screen-clearing ultimate attacks – which consume stamina and focus, respectively – brawlers can dash, roll and perform basic punching attacks which are further augmented depending on their movement speed. 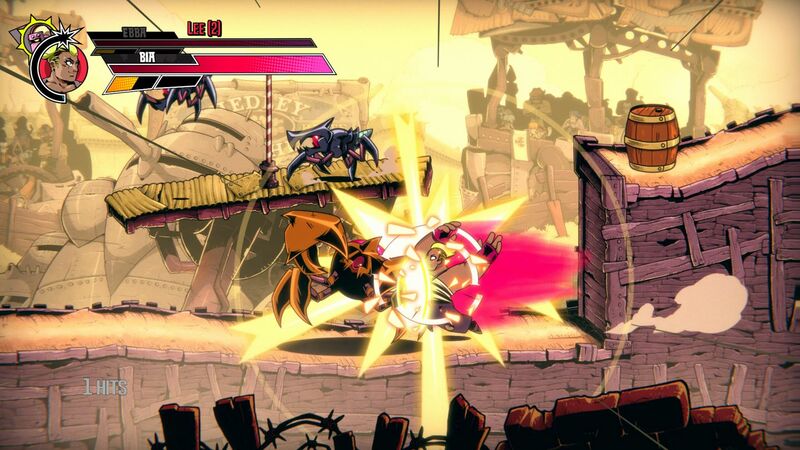 Moreover, characters can make use of items within the environment, such as explosive barrels, poles, and spikes, which can help greatly improve the odds during combat. Brawlers can be tagged in or out at any time, which is useful for when one of them is knocked out or low on health. 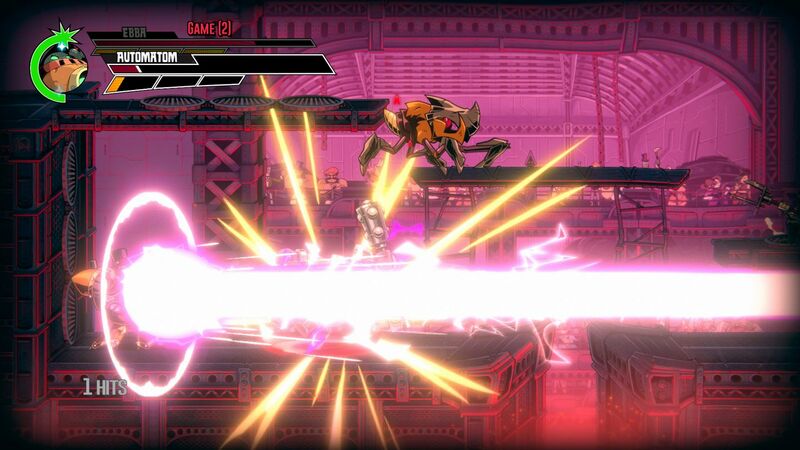 A character entering the stage can deliver a powerful blow due to momentum, potentially altering the flow of the battle. Only some health is restored in-between stages, so it’s wise to utilize all of the available tools to remain unscathed. At the end of each championship, brawlers are awarded with gold coins, fame, and equipment based on how well they did; success is measured in medals — either bronze, silver, or gold. Equipment is an important consideration when preparing for a championship. Each character has a set of unique attributes and there are certain RPG elements to the game. Some brawlers are faster and deliver punches more swiftly, while others may be sluggish, yet hit like tanks. Everyone can be equipped with gloves which improve their attack, boots for defense and an accessory which often grants a unique ability or improves an existing one, like being able to jump higher. All items are divided into tier and rarity and can be purchased for gold coins via the various shops, but the superior equipment is awarded for earning a gold medal in a championship. Characters level up when accumulating fame and their abilities can be improved by allocating skill points; all brawlers develop equally, regardless if they’re being actively picked or not. Enemies come in a wide variety and most of them have strengths and weaknesses. For instance, a fire-based enemy is strong against poison, but vulnerable to vernantium attacks (a special element within the game), and it’s important to pick the right equipment, which exploits these weaknesses, especially in the more advanced leagues when the game becomes substantially more difficult. It can be challenging to obtain a silver medal on any given championship, let alone the coveted gold medal. Thankfully then, previously completed levels can be revisited with better equipment. It is extremely satisfying to replay levels while being overpowered, beat record times and obtain better items as a result. The relative monotony of each championship is broken with additional challenge levels. These can range from simple pole races with a single goal of crossing the finish line in the quickest time, to singleton levels which require the characters to deal as much damage as possible in the allotted time-frame. Every level can be completed either solo or in local/online co-op, and leaderboards are present for particularly competitive players. 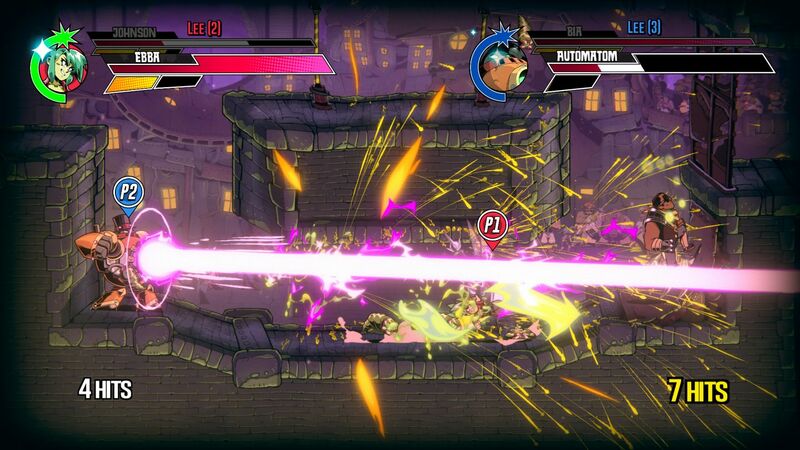 During co-op, two players can pick a tag-team of brawlers; enemies become tougher, but progression is made significantly easier with the addition of the second player. Battles can become chaotic with two players simultaneously jumping, punching and tagging on the screen, but are enjoyable nonetheless and the overall progress is saved for each player. Despite the inclusion of diverse challenge levels, the game does become somewhat repetitive, and the otherwise enjoyable brawling experience is marred by numerous bugs and glitches – some minor, and some not so minor. For instance, a character might get stuck in the environment upon being knocked out, or continuously fall into a pit, requiring a restart, and background music often stops after restarting a stage. Worst of all, the completion time for certain stages may not register correctly, awarding a lower medal than it should. Speed Brawl is excellent when it’s at its peak; it’s comparable to titles like Scott Pilgrim vs. The World: The Game, and Skullgirls, both in terms of visuals and gameplay. However, it adds a twist with the inclusion of timed events and, should the copious number of bugs not deter you, is worth the attention for its fluid action-packed gameplay and the alluring visual get-up alone.